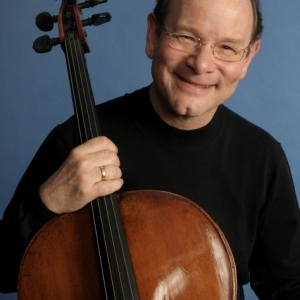 DAVID GEBER had his early musical training in Los Angeles, where he was raised in a family of professional cellists. He holds both undergraduate and graduate degrees from The Juilliard School. Mr. Geber has been recipient of numerous cello and chamber music awards, including the Walter W. Naumburg Award and the Coleman Chamber Music Prize. He has appeared as soloist at Tanglewood Music Center and Aspen Music Festival, as well as with the Philadelphia Orchestra and Montreal Symphony. A strong supporter of new music, he has premiered numerous works for cello as well as for varied chamber combinations. As founding cellist of the American String Quartet, he concertized and recorded internationally with that ensemble for nearly thirty years, having given concerts in all 50 of the United States and playing up to 100 annual engagements. Mr. Geber is Director of Chamber Music at Manhattan School of Music in New York City, as well as a longtime member of the School’s cello and chamber music faculty. He is currently artist/faculty at Music Academy of the West in Santa Barbara, California. Other seasonal festival appearances as performer and teacher have included the Aspen Music Festival & School, Heifetz Institute, Meadowmount School of Music, Tanglewood Music Center and National Arts Centre of Canada. He is also an exclusive, worldwide artist/representative for Jargar Strings. Mr. Geber has recorded for Albany Records, Capstone Records, CRI, Musical Heritage Society, New World Records, Nonesuch Records, and RCA. He has served as adjudicator for major international string competitions including Bordeaux, Evian, Naumburg, Isang Yun and Coleman. He is Co-President of the Walter Naumburg Foundation (New York City) and Vice President of American Friends of Kronberg Academy (Germany). He plays a rare Ruggieri cello, made in Cremona in 1667.